SAVING A SUBSPECIES. In March, the last male northern white rhinoceros (NWR) died, leaving behind just two females of the subspecies. Without any way to procreate naturally, it may look like the subspecies is nearing extinction. But some scientists have a way to make sure the NWR (well, its genes at least) doesn’t disappear forever. An international team of researchers has successfully created NWR hybrid embryos in the lab, according to a study published Wednesday in the journal Nature Communications. A MEDICAL FIRST. 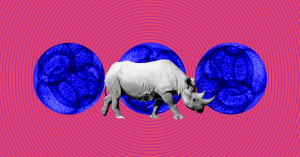 To create these hybrid rhino embryos, the researchers first extracted eggs from female rhinos of a closely-related subspecies, the southern white rhinoceros (SWR). This was a risky procedure, since the ovaries are close to a “huge artery,” researcher Thomas Hildebrandt told the BBC, and puncturing it could kill the animal. Next, the researchers fertilized the eggs using sperm collected from now-deceased male NWRs while they were still alive. These hybrid embryos developed into blastocysts — the stage of development at which the researchers could implant them into a female. This is the first time anyone has successfully developed rhinoceros embryos to this stage, according to a Nature Communications press release. The researchers froze their hybrid rhinoceros embryos so they can try implanting them into a female SWR surrogate using in vitro fertilization (IVF) at some point in the future. FULLY NWR. The researchers also hope to extract eggs from the two living NWRs to create embryos that are 100 percent NWR. They’ve already reached out to Ol Pejeta Conservancy in Kenya where those rhinos live and are awaiting permission to attempt the procedure. “Our goal is that we have, in three years, the first northern white rhino calf born,” Hildebrandt told NPR. Given the risks involved with egg extraction, however, the Conservancy might be wary of putting either remaining NWR in harm’s way. If that’s the case, the hybrid NWR/SWR rhino embryos might be our only shot as saving at least some genes of the almost-extinct subspecies.